Before I became pregnant, I used to wake up at five o’clock every morning and blissfully practice yoga for 45 minutes. I relished the silence, the calm, the feeling of being alone with my true self. After having a baby, my routine went out the window and I have learned to take my yoga-induced bliss where I can find it. As a new mother I struggled to find the time and space to practice yoga. I received a lot of advice about how it was essential to take “me time,” and if I didn’t, it was tantamount to mama failure. But as a mother who works outside the home and is away from her baby for ten hours a day, my heart told me that I could not sacrifice time with my son for “me time.” On the other hand, I was feeling stressed and exhausted, and I wasn’t able to fully enjoy the time I did have with my son. I knew I couldn’t give up time with my son, and I knew I had to find time to practice yoga. It took me a few months, but I finally found a way to make it work. The key was acknowledging how important yoga is to me, and being flexible enough to practice yoga outside the comfort zone of my usual routine. Here are a few tips that helped me start and maintain a home yoga practice. If you are looking for a way to begin, they may help you as well. Decide if yoga is truly a priority. Do you believe yoga will help you create balance in your life? If so, why? Be honest with yourself. Parents have precious little “me time.” If you can only do one or two things a day (or a week!) that will help you create balance, can yoga help? Practice yoga that makes you feel good. I used to practice yoga by following a video and I wouldn’t do it unless I had a minimum of thirty minutes. If I had remained wedded to that rubric after my son was born, I would get to practice yoga about once a month. These days, I practice yoga for the amount of time that I have. If I only have ten minutes, then I practice yoga for ten minutes. In the past I would have thought a ten minute yoga practice wasn’t worth the bother. Today as a mama, I know that it is not only worth it, but it is my yoga bliss. Furthermore, instead of following a video, I follow my heart. I practice poses that feel good, work out the stress of the day and help me feel present and centered. Be flexible. Life as a parent is nothing if not unpredictable. But once you have made the commitment and you know what feels good, you have the tools you need to maintain a regular home yoga practice, even during the most chaotic times. It doesn’t matter if you practice in the morning or in the evening, for five minutes or an hour, indoors or out. What matters is that you are striving for (and some days even achieving) balance through a home yoga practice. 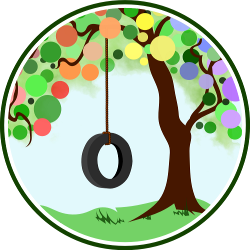 Natural Parents Network is happy to host today’s guest post written by Dena. Dena is mama to one year old Josias. She is learning to apply her love of natural living to parenting. 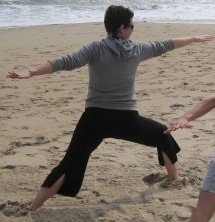 She blogs about motherhood and yoga at Earth Mama Yoga and also writes as the Washington, DC Breastfeeding examiner. I have used Gurmukh’s new mother yoga DVD quite a bit to do yoga with the babies – and other family yoga DVDs with the kids. Thanks for you comment, Amy. I haven’t seen that video. I’ll have to take a look. Thank you for the reminder that 10 minutes is worth it. I have a subscription to http://www.myyogaonline.com, but have gotten away from it. One of the reasons I joined is that I can access it any where, any time, but also because they have routines that are less than 15 minutes. Time to get started again. I know I will thank myself. Thank you for this post! Hmmm, that sounds interesting. There are also downloadable routines available on yogajournal.com . I had such a hard time finding my way back into yoga practice after my son. I had started yoga 6 years ago after my car accident and it helped tenfold with my pain and my day to day stresses. I had to remind myself that I wasn’t the me or the mom I wanted to be and needed to find those moments to regain peace and gather myself for the next moment. Beautiful post and I thank you for the new tips. I know, sometimes it’s so difficult to make time, but I am just like you and remind myself how great I will feel and that I will be a better mother for it. Thanks! Woot Woot! Thanks so much for writing this. I haven’t been able to get my mind wrapped around practicing yoga movements as a new mother. The closest practical advice I’d read was to keep going despite the baby climbing all over you, but this gets closer to what I needed to read/hear. Thanks so much! Thanks Anayah. Good luck! I haven’t been able to find a way to practice while my son is awake, though as he get older, I hope I can start practicing with him a bit.